Player at the World Cup 1966 Final!! Ray Wilson the unassuming and cultured left back, who won the World Cup with England and amassed a total of 63 caps, had an unusual start for a footballer. Although spotted by a scout from Huddersfield Town as a youngster, he was an apprentice railway man before, after doing his two years National Service, he eventually signed professional papers. Although Huddersfield were then in the top division, it wasn’t long before they were in Division Two, but Wilson notched 30 caps despite this, before Everton snapped him up, despite former Huddersfield manager Bill Shankly trying to buy him for Liverpool. Wilson’s debut came in a 1-1 draw with Scotland and over the next year he established himself in the side, which at the time was selected by an FA committee and coached by Sir Walter Winterbottom. Many players were concerned about their team places when Sir Alf Ramsey took over in 1963, as he had forced the FA to accept his utter and complete control over team selection. Wilson was not one who needed to worry. Not only did he have strength and speed, but also good distribution and excellent positional awareness, which was essential to operate Ramsey’s tricky but effective zonal marking system. 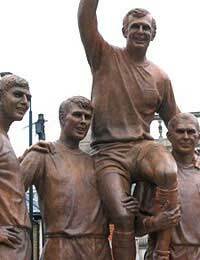 Bobby Moore appreciated Wilson’s unflappable nature, saying that it was a comfort to play alongside him, and he was regarded by many as the best left back in the world. The World Cup saw Wilson still far and away first choice for left back at the age of 31, and he enhanced his reputation further as he fitted so well with Ramsey’s chosen tactics. “What you had to do for Alf was graft and work hard” he said, as the team sat back and hit hard on the break, putting extra pressure on the defense. It’s a measure of his success that one rare error sticks out in the memory, when his weak headed clearance fell to West German striker Helmut Haller, whose low shot opened the scoring in the final. But characteristically Wilson carried on putting in a near-faultless display as England ran out 4-2 winners. Wilson is featured in one of the most iconic scenes of England’s win, being one of the players hoisting Bobby Moore and the Jules Rimet trophy aloft. He was still around when all the other players had gone off celebrating around the pitch and the photographers persuaded him to lift Bobby; “otherwise I would not have been there, believe me” he later said. Wilson remained a mainstay of the England team for a number of years, featuring in the European Championship run of 1968 which resulted in third place. A knee injury, shortly after that competition, and the emergence of a new star in the form of Leeds United’s Terry Cooper, meant the end of his England career. He recovered and returned to playing with Everton but he couldn’t restore his old speed and eventually retired in 1971. People tend to assume that his name is short for “Raymond”, but in fact his mother called him “Ramon”, after her favourite Spanish film star. Although he changed it to "Ray" as soon as he could, Wilson attributed of his fierceness to the name that his mother gave him. It’s also likely that he also inherited her determination, as she had to try a number of different registrars before she found one who would accept it! Both before and after England’s World Cup victory in 1966, Wilson never made use of the fame that his skill delivered, and when his playing career ended he left the game to join his father-in-law in setting up an undertakers business, retiring in 1997. Along with the four other players in the 1966 final who had not received any honours, he was awarded the MBE as a Millennium honour in 2000. He had previously sold his winner’s medal to fund his retirement, as Huddersfield refused him a testimonial, the usual gift in those days, after ten years faithful service.